The very early Universe was hot and comprised mainly of plasma (ionized gases), but it cooled rapidly as it expanded. When it was around 378,000 years old, its temperature became low enough for neutral atoms to form – mainly Hydrogen and Helium – during an epoch known as recombination. For hundreds of millions of years afterwards, the Universe remained a cold, dark neutral place throughout a period known as the ‘dark ages’. These conditions persisted until the first stars began to heat up and light the Universe, marking the start of the Epoch of Reionization. At around 210 million years after the big bang, the first stars – known as Population III stars – began to form. These stars were made almost entirely of Hydrogen and Helium, and reached enormous sizes – sometimes up to hundreds of times the mass of our own Sun. By contrast, stellar populations in the current epoch contain, in addition to Hydrogen and Helium, small amounts of heavier elements (generally referred to as ‘metals’) that were formed in the life cycles of earlier generations of stars. These metals aid cooling, allowing the clumps of matter from which stars form to collapse and fragment more easily, leading to much lower stellar masses. It is thought that Population III stars formed in small groups, in dense regions of gas – quite unlike today’s stars which are often observed in galaxies of billions of stars. These small groups of giants had relatively short lifetimes but they emitted strongly in the ultra-violet part of the spectrum, providing radiation of the right frequency to begin to ionize the gases in the medium around them. Slowly, these stars started a phase change across the entire Universe, returning it to the ionized state it was in before recombination. They created bubbles of ionized gas around them which expanded and merged, pushing outwards into an otherwise cold and dark Universe. An artist’s impression of Population III stars in the early Universe, 400 million years after the Big Bang. Image credit NASA/WMAP Science Team (2007). My work looks at these ionized ‘bubbles’ around the early stars, to understand how they propagated through the medium and expanded to leave the entire Universe ionized, as it is observed today. The initial development of these bubbles around the first stars is thought to have occurred in a very similar way to the formation of regions of ionized gas around stars in the current Universe, where a star’s ionizing radiation locally converts the surrounding gas of the interstellar medium (ISM) into plasma. 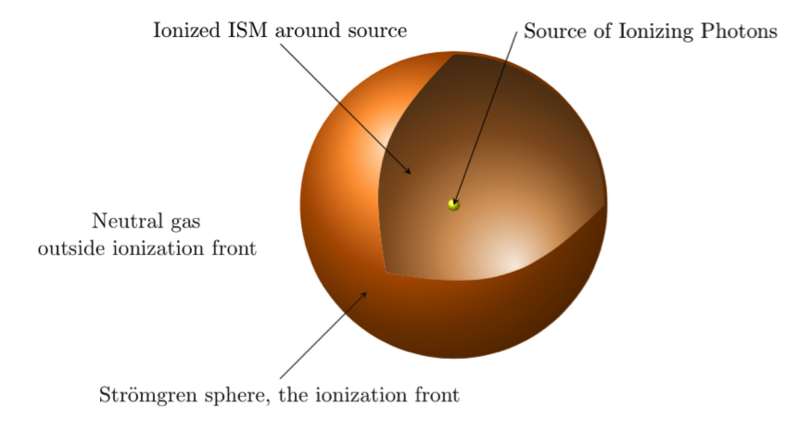 In 1937, Strömgren modelled the ionization front (being the boundary between the ambient neutral gas and the ionized gas closer to the star) as a sphere, propagating outwards from a driving source of ionizing radiation. Diagram of the key elements of the Strömgren sphere model. To understand this model, the process of ionization can be considered on an atomic level: neutral atoms (with no overall electric charge) consist of a positive nucleus, surrounded by negatively charged electrons. Ionization is when one (or more) of these electrons is removed, leaving a positively charged ion and a freely moving electron. Within the neutral atom, electrons are in well-defined energy levels (according to Quantum Mechanics). This means a well-defined minimum energy must somehow be provided to an electron in order to remove it – in the case of Hydrogen, the energy required is 13.6 eV. This energy can be provided in a number of ways, but the mechanism relevant here is called ‘photoionization’. In this process, a photon of enough energy (i.e. more than 13.6 eV for Hydrogen) is absorbed by one of the electrons in the neutral atom. The resulting energy gain of the electron is enough to allow it to escape the electrostatic pull of the positive atomic nucleus and move away freely. This is the main process occurring at the ionization front. Returning to the overall picture of the Strömgren sphere, its expansion can be thought of in terms of a succession of thin spherical shells: if the ionization front is one such shell, the layer of ambient neutral gas just ahead of it can be thought of as another shell, yet to be ionized. Photons are emitted from the ionizing source (the star) at the center of the Strömgren sphere and if enough of these photons reach the front, they can go on to ionize the next shell of neutral atoms. The front is then located ahead of this newly ionized layer, and the sphere has expanded. The sphere isn’t able to expand indefinitely, however – the further the front moves away from the star, the more ‘spread out’ the photons become. So, as the radius of the sphere increases, the number of photons reaching a given area of the ionization front decreases. Since there are unlikely to be any significant changes in the density of the ISM ahead of the front as it propagates outwards, the number of neutral atoms ahead of the front will not change. This means that, as the front expands, it slows down – there are fewer ionizing photons per unit area per unit time to ionize the neutral gas ahead, so it takes longer for a volume ahead of the front to be ionized. Eventually a limiting point is reached when all photons propagating towards the front from the star are lost to various processes in the intervening ionized region meaning no further gas can be ionized, and the sphere can expand no further. Of course, the Strömgren sphere has its limitations, and only considers some of the applicable Physics: essentially, this model is just an exercise which counts photons arriving at the ionization front and compares this to the number of neutral atoms just ahead of the front to determine how fast the ionization front can propagate. The model doesn’t fully account for the fact that some of the ionized gas within the ionized sphere will recombine, so to maintain the ionization level behind the front some photons must be ‘wasted’ on their journey from the source in ionizing these recombined atoms once again before even reaching the front. In addition, when applying the Strömgren sphere to the context of the Epoch of Reionization, factors relating to the expansion of the Universe would need to be considered – for instance, the decrease in the density of the ambient medium as space-time expands, subsequently increasing the path length of photons as they pass through it and tending to increase the rate at which the ionization front can move forwards. Work by Axford (1961), Goldsworthy (1961) and others has also indicated that shocks and instabilities can arise in the ambient gas due to the combined effects of heating and ionization. 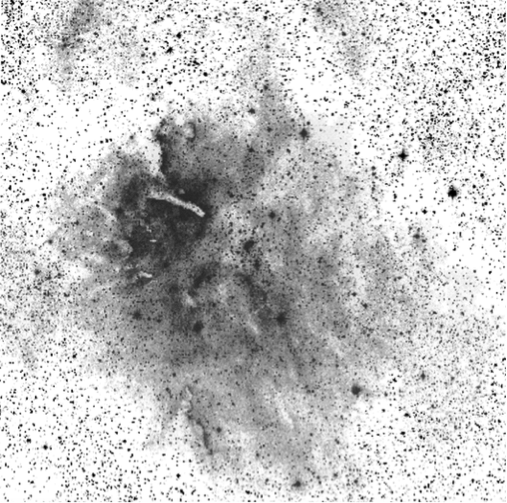 These can eventually lead to the development of density fluctuations in the gas ahead of an ionization front, changing the resulting morphology of the ionised region to something much more complicated than a simple sphere, including features like ‘shadows’ and ‘elephant trunks’ – as observed, for example, in the ionised region around NGC 6820 (see the image below). Palomar Digitised Sky Survey plate of NGC 6820, clearly showing elephant trunks (top left of the darker ionised region) and shadows. Image credit: The Palomar Digital Sky Survey, as used in ‘From Ultracompact to Extended HII Regions’, The Astrophysical Journal, 469: 171-188 (1996). That said, as an approximation, the Strömgren model is still very useful and can tell us a lot about the effect the earliest stars and galaxies had on their environment: it shows that they could ionize vast regions of gas around them – much in the same way that stars observed today can carve out ionized bubbles in otherwise neutral gas clouds (sometimes this can be seen quite clearly in images, as with the Rosette Nebula below) – and that the expansion and merging of these regions, over hundreds of millions of years, eventually led to the reionization of the entire Universe. 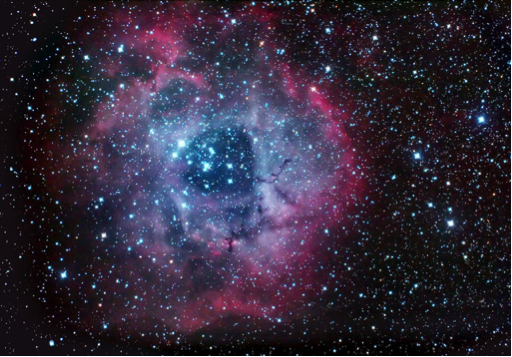 The Rosette Nebula (NGC 2237), showing a Strömgren sphere in in the middle of the image. Image Credit: John Lanoue (2011).